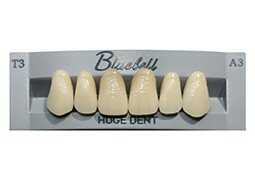 Bluebell is a classic two-layers-outlook effect teeth line, made of general PMMA resin. Bluebell is suitable for both anterior and posterior areas. Designed according to the most classic teeth shape in the world, Bluebell can fit all facial characteristics around the world. Having adopted the advanced heat and cool press molding and enamel layer wrapping technology, Bluebell becomes the most popular economical tooth in the world today. Bluebell is a classic two-layers-outlook effect teeth line, made of general PMMA resin. Bluebell is suitable for both anterior and posterior areas.